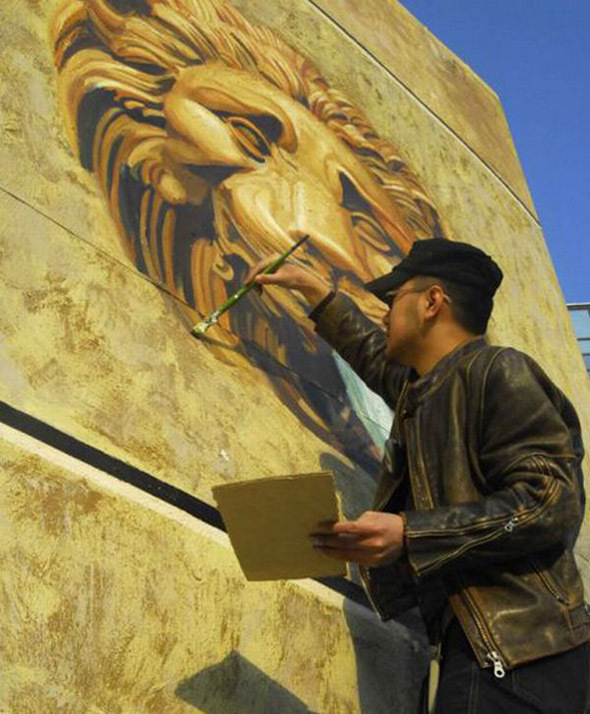 I can’t believe we missed this one – Qi Xinghua is a Chinese 3D Chalk artist (first in his country) whose painting entitled Lions Gate Gorge earned him an entry in the Guinness Book of Records for the largest 3D painting in the world! I’m not exactly sure how fresh this information is, as I could swear we’ve seen bigger. Still, with 23 meters in width, 32 meters in length and over 6 meters in height, we can’t ignore hard work Qi invested into this masterpiece. 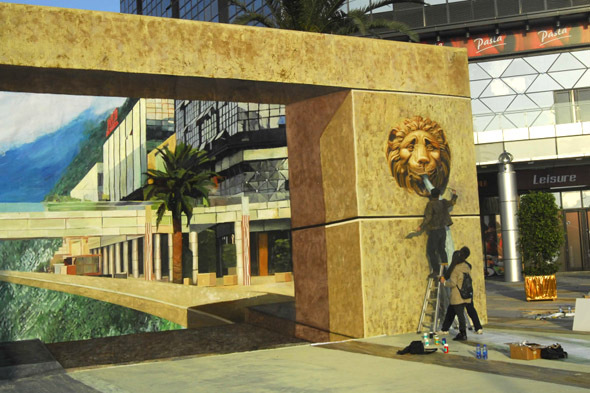 This 3D painting was presented at the Baiyan Wanda Plaza shopping-mall in Guangzhou (China), and it took Qi more than a month to finish the project. Oh, and one more interesting fact: apparently some people reported dizziness, during their “rope balancing”. To put it in the simplest way, it’s reversed vision, which is also called inverse-perspective. From our normal vision, nearby objects are big and far away ones are small. I use the opposite method to make far away objects big and close objects small. In this way, a two-dimensional painting turns three-dimensional. Don’t ask me why, but I have a feeling we’ll be seeing much more of this artist’s creations in the coming weeks! Even after seeing so many awesome pavement drawings, I can’t seem to perceive below pavement as a flat surface. How about you? Next I Bet You Won’t See It (The Illusion)! 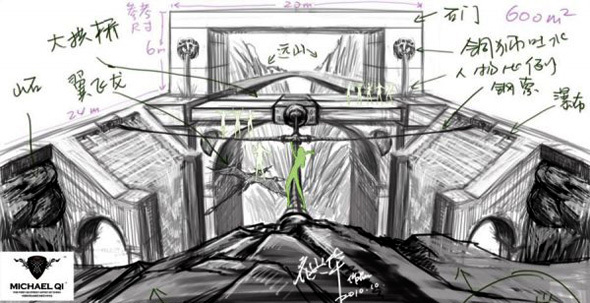 how did he do the stuff behind the arch? Hey Liz the arch was actually drawn on the sidewalk which makes it even more amazing. The pillars with the lions head fountains is where the solid wall starts. From there everything else was drawn on the sidewalks. As you can see from the close-up picture of the artist, he is standing upright. which in turn means that the drawing is not in fact on the sidewalk but on a billboard of some kind. WOW–With a capital OW! Magnificent! hi. woooooooooooow so cooooooooool! :-D not to be mean. most amzing chalk drawing ive ever seen! I try to see thats its just a painting.. There is no better way this could be projected. Shadows will always be visible. The only thing he could do is paint a flat area on the location where the shadows will be but that wouldn’t look pretty good either. I’m honestly puzzled by your statement this was ‘spoiled” due to the fact the ‘shadows’ are not in the right places in your opinion? Are you aware of the myriad of objects both stable and moving which are capable of distorting shadows? If not I think you might enjoy a basic physics class along with a trigonometry class. If you’d like to see some of the incredible things which can be done with shadows try this link, some of the images are nothing short of awesome! http://funnyfunda.com/amazing-skills/wonderful-shadow-art.php ~ The site is ‘Wonderful Shadow Art / FunnyFunda. If you want even more, do a Google Image Search on ‘Shadow Art’ just make sure you search it when you’ve the time to check – out as many of them as catch your interest which I can say from experience is a considerable number! I think that’s the best chalk drawing on this site. I’d love to see it in person. WOW!! This is a masterpiece for sure!! Hey, uh, this mobile version is weird. Just saying. This illusion is the best chalk drawing I’ve ever seen. this is the best chalk drawing ive ever seen in all of the places ive been too. i just love 3D chalk drawings! they are awesome!!! That’s amazing! Totally Awesome! Yes, do bring us more of this beauty! Dude that is the coolest thing i have ever seen in my life! I would love to see chalk drawing like this in person- is there any sort of list of locations where they have been created in the United States? Particularly somewhere near Chicago. But a list of them anywhere would be welcome. Did he use chalk or paint? This would make it more permanent, and it wouldn’t wash off in the rain. It’s great. It’s awesome! And big… Was the falling ice one bigger,or is this one bigger? 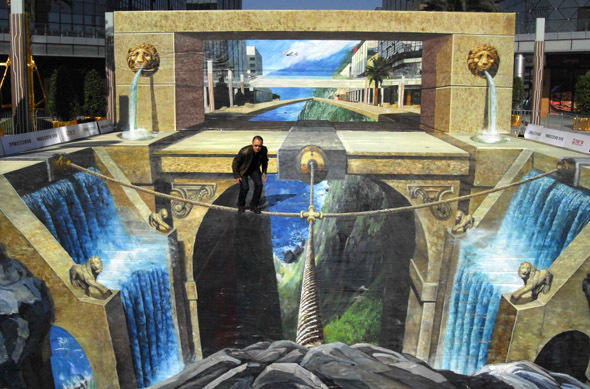 This is one of the best 3d chalk drawings I’ve ever seen, & maybe even the biggest. This one is really hard to tell that it’s just a flat chalk drawing,But so worth the mind game none the less. Despite the obvious pastel colouring, I’m having great difficulty convincing myself this is actually just flat. Very cool painting (not chalk, based on the picture of the artist and a paintbrush). Also noted an error: The light source (sun) is to the right, based on all the shadows. Except the shadow of the water from the left lion’s mouth. The feeling dizzy on the rope thing must be rubbish- I can see you getting vertigo from the view point- but from on the rope you wouldnt see the illusion at all- just lots of wierd stretched colours. I would be walking around. OMG Fantastic! This is a masterpeice! I can’t help but gape in awe at the facination. It really is illusional. 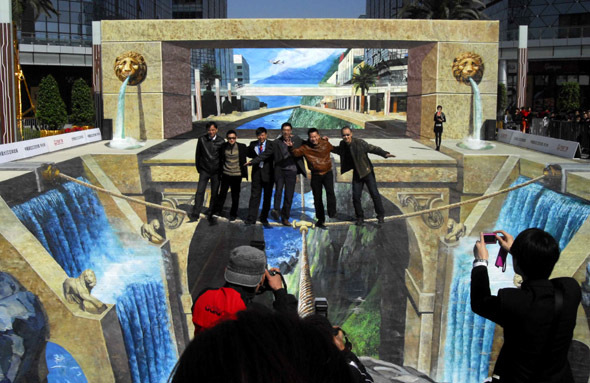 dude i wanna stand on one of these 3D chalk drawings! best illusion ever, it make my mind freak. did he really paint in a flat object? Please reveal more about this image. WOW WOW WOW WOW WOW WOW WOW WOW WOW WOW WOW WOW WOW WOW WOW WOW WOW WOW WOW WOW WOW WOW WOW WOW AND AN EXTRA WOW!!!!!!!!!!!!! This “Chalk Drawing” Should Belong To The “ABSOLUTELY AMAZING” Category Of Optical Illusions!!!! It looks so real, how cool. I love it!!! It is so cool. I LOVE this. I am trying not to see it as 3D but 2D but I fail every time. This is impressive. it blows my mined that someone could visualise how to plan an paint that out!!!! That must have taken forever and it is just crazy/awesome!!!!!!! I really want to see this. I live in Guangzhou and I’ve gone to Wanda plaza twice and cannot find the actual work of art. Can somebody please tell me exactly where around the mall it is? Wanda Plaza is enormous! I asked at Starbucks there and nobody knew of it. I asked at the nearby Hilton and same thing. Was it just temporary and chalk? I mean above you can see a photo of Qi Xinghua using a paintbrush…. Any help would be VERY appreciated! Amazing!!!!!!! I don’t know how they do this. Because it is just phenomenal, I wish I could see someone do this in person, because it just blows my mind! I’d love to see something like this created in person, as well.